This time the spotlight will be shining on Ossuary, a haunting, uncanny title – perfect for this Friday the 13th! Let’s see if we can’t help it escape the cold emptiness of Greenlight limbo, eh? 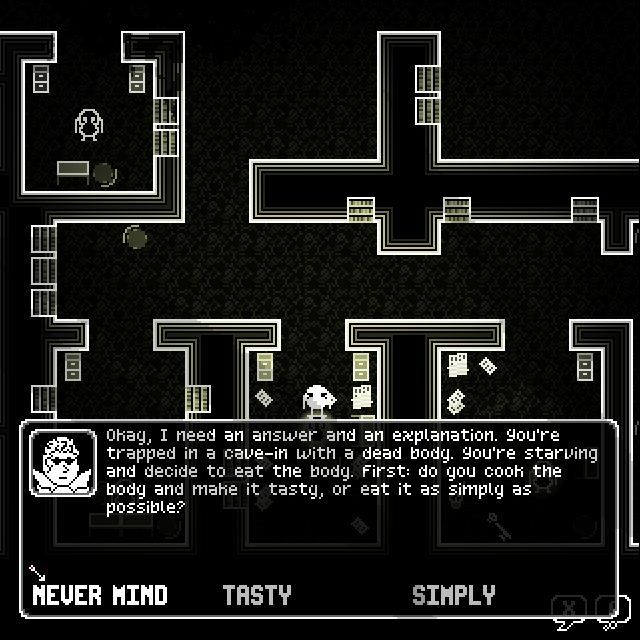 Ossuary is a game where you talk to people in a dark and horrific place. It’s a funny satire about human nature and society. It’s a journey through a place of bones where virtues are sins and sins are inventory objects. It draws from the Discordian religious tradition and from the world’s collective mythology of death. There is something in the corner of your eye and you must escape this place. Solve dialogue-based puzzles but do not believe a word anyone says. Is it just me, or does that sound every bit as confusing as intriguing? I mean, I like the part about not trusting anyone, even if that is a bit of a bleak point of view. Also, “sins are inventory objects”? That’s definitely original, while also… slightly disgusting. Bet ya this is one of those games that won’t make sense until you’re half-way through, and then the darn thing is going to pull a 180, or some such. And I’m not just saying that because I have no idea what’s going on, even after playing the demo. Okay so maybe I am. Still… it’s something I want to see more of, so there’s that. Let’s get this bizarre creation onto Steam already, people. So riddle me this, dear reader: why is Ossuary still struggling to get through Greenlight? It’s been out for a while, so it’s not like you’re voting on an unfinished project here. As such, how about visiting its Greenlight page and handing over a ‘yes’, if you like what you see? Remember: your vote matters!